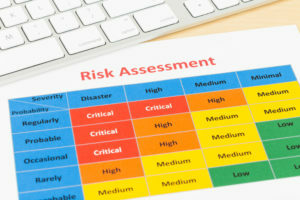 Risk assessment are completed so that you can identify possible causes of harm, the likelihood of that harm actually occurring given the safeguards already in place and any further safeguarding measures needed to reduce that likelihood still further before an accident occurs. A hazard is anything with the potential to cause harm e.g. a knife in catering. The potential severity of harm from our knife could be a minor cut needing a plaster if peeling potatoes with a small knife or a serious cut or worse if chopping with a large knife. The likelihood that an event of a particular severity will actually occur takes into account the control measures already in place e.g. use of a potato peeler instead, use of a chain-mail glove when chopping, proper training. The level of risk is the product of the likelihood and the potential severity. A high level of risk is one where an event is very likely to occur and may cause death or serious injury/illness. A low level of risk is one where an event is unlikely or would result in a trivial or minor injury/illness with little or no time off work. A medium level of risk is in between these two e.g. an event that is reasonably likely and could result in several days off work. By carrying out a risk assessment, you can direct attention and resources where they are most needed to prevent injuries or ill-health. The rating will vary depending on what the likely hood of that event actually happening. Usually this in a range of most unlikely, unlikely, likely and most likely, in other words, minor to major injuries. Risks are then in three groups, low risk, medium risk and high risk. Low risk – unlikely to cause an injury but action can still be taken to reduce this group more. High risk – Special control measures must be in place and training. This group is reviewed to try and reduce the risk where possible but this is not always the case.